At the end of the spiritual retreat, that brought the two political adversaries from Southern Sudan together at the Santa Marta house, Pope Francis made an unexpected gesture. 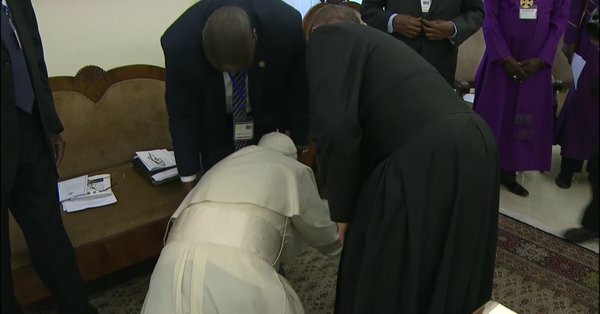 He knelt down to kiss the feet of the two leaders who led the country into civil war. Pope Francis asked them “from the heart and with their deepest feelings” to keep the peace. Recently an armistice has been signed and from the month of May a transitional government will be created in which both leaders will participate. Salva Kiir, the president of South Sudan, and his opponent, Riek Machar spent two days together in the Vatican to pray for peace. Pope Francis spoke of “another gaze”: that of the people, a gaze that “expresses their ardent desire for justice, reconciliation and peace”. The Pope expressed his “spiritual closeness” to refugees and the sick. Pope Francis, “and I pray that the fires of war will finally die down, so that they can return to their homes and live in serenity”. The Pope then referred to the peace agreement signed by the highest political representatives of South Sudan last September. He congratulated the signatories of that document for having “chosen the path of dialogue”, for their “readiness to compromise”, and for their “determination to achieve peace”. Pope Francis confirmed his hope and desire “that soon, by God’s grace”, he would be able to visit South Sudan, together with the Archbishop of Canterbury, and the former Moderator of the General Assembly of the Church of Scotland. The Pope then concluded his meditation with a prayer, in which he asks God the Father: “to touch with the power of the Spirit the depths of every human heart, so that enemies will be open to dialogue, adversaries will join hands and peoples will meet in harmony… May the whole-hearted search for peace resolve disputes”, prayed the Pope, “may love conquer hatred and may revenge be disarmed by forgiveness”.